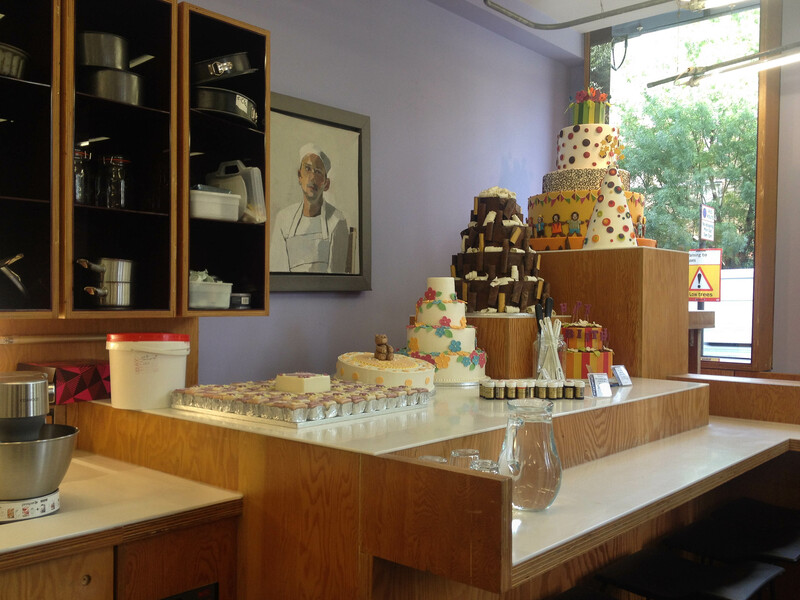 Last weekend I attended the All About Sponge class at the Konditor & Cook Cake School at Stamford Street in London. My Dad bought me a Luck of the Draw ticket for my birthday, and I’ve been holding out for this particular class for many months! 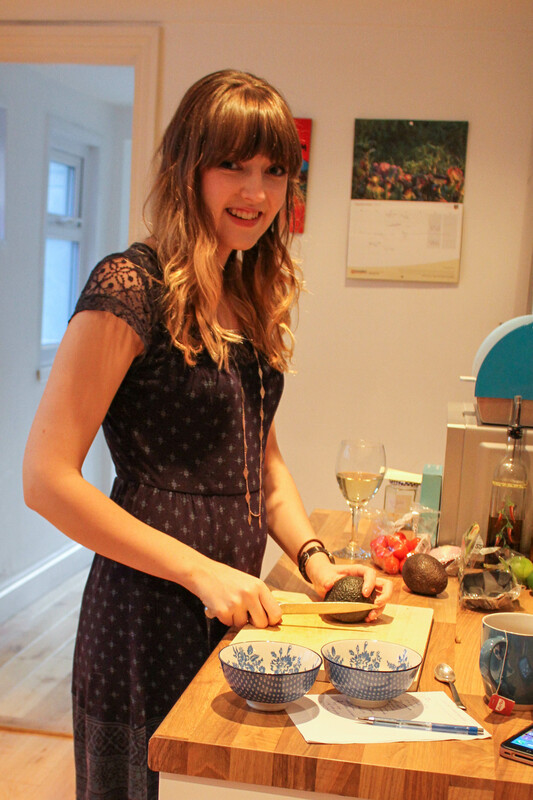 Although I bake on a weekly basis, I liked the idea of taking their most basic class – the idea being that, as I create a lot of my own recipes, improving my knowledge of the basics could only be a good thing. The class itself was small, with room just six of us, plus our lovely teacher Laure and her assistant Lucy. 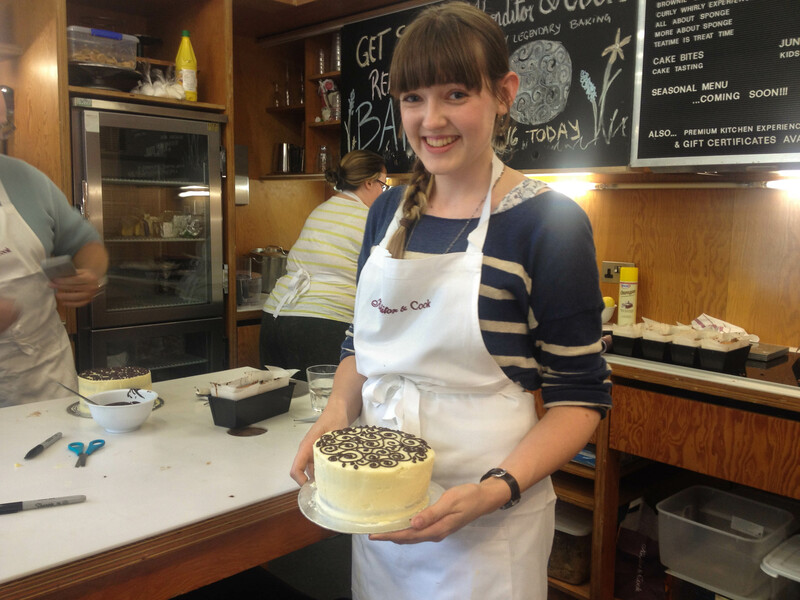 There were another keen, regular baker like myself, one person who had never made a cake before, and everything else in between – but the class catered for everyone. It was very informal and a lot of fun, with laughter fuelled by tea, cake, and the discovery that a computer fan can split a once-perfect cream cheese frosting (who knew?). 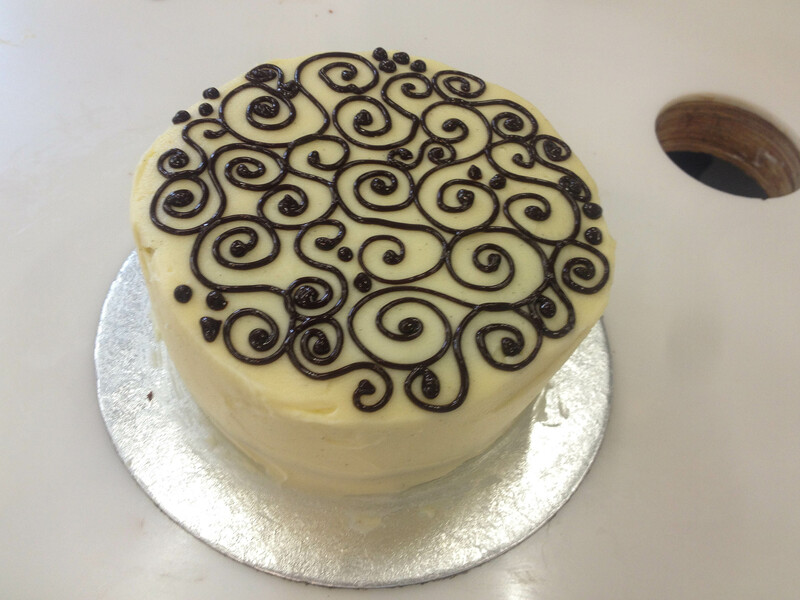 We began by pairing up and starting work on mini versions of Konditor & Cook’s signature Curly Whirly Cake, by making a dense, fudgy chocolate cake. 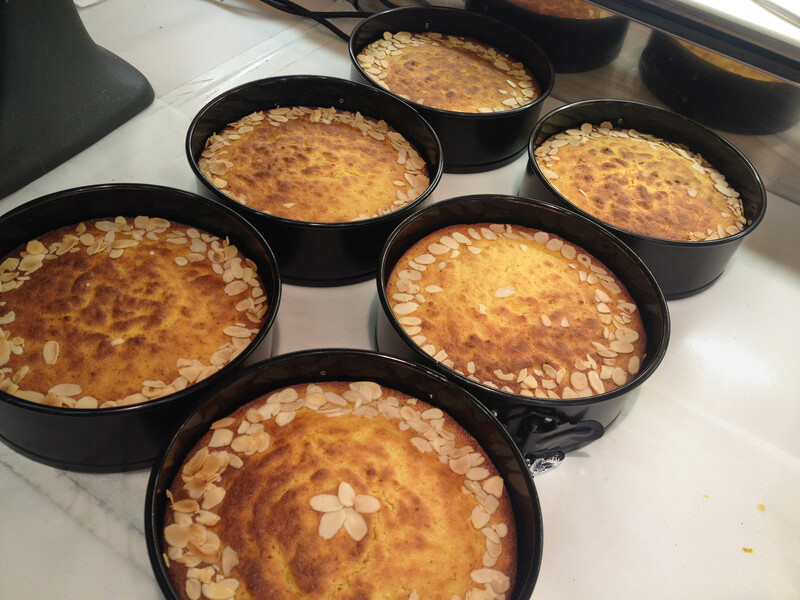 While this baked, we made the gluten- and dairy-free Almond St Clements Cake, which was incredibly quick to make (as the part that involves boiling oranges for two hours had been done for us! ), and very simple: definitely one I plan to replicate at home – boiling oranges and all. We topped our batters with flaked almonds and transferred them to the oven, then sat down to tea, coffee, and – of course – some Konditor & Cook cakes to snack on. We were given small slices of Lemon Chiffon and St Clements cakes, and bitesize Curly Whirly cakes. After our tea break we paired up once more to make lemon pound cakes, before being shown how to apply the crumb coat of frosting to our Curly Whirly cakes. I’d never actually used a palette knife before, and I think it’s something I’ll be purchasing next time I want to frost cakes: it’s much easier to create a smooth, even finish than it is with a knife (which is what I usually use). Our crumb-coated cakes were put in the fridge while we glazed the cooled St Clements cakes, then retrieved once more for the final layer of frosting and the chocolate decoration. We were shown how to make piping bags using greaseproof paper and origami magic, then given a chance to practice piping our ganache before taking the plunge on top of the cakes! I loved this part, and was pretty pleased with my result, which, though not perfect, I thought was recognisable as a K&C Curly Whirly cake. 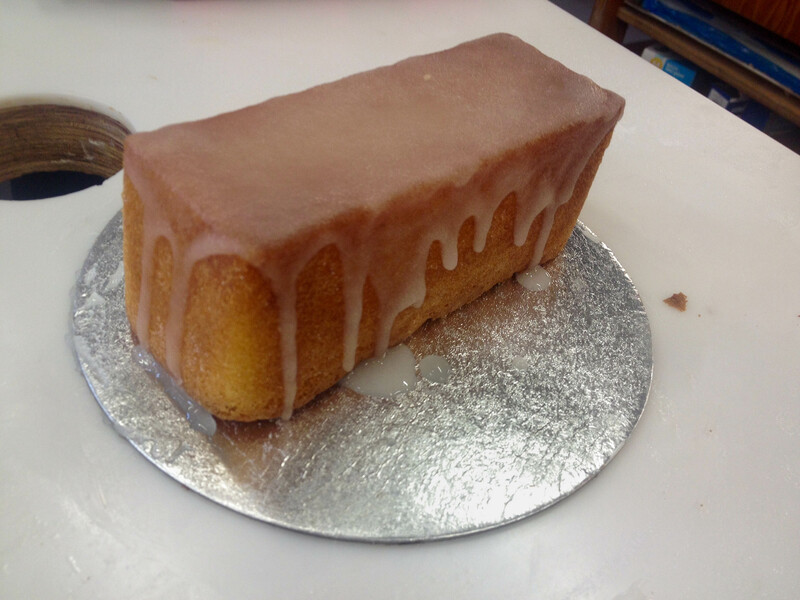 We finished the class by spreading a crunchy drizzle topping onto our lemon pound cakes and boxing up our creations. This was one part I was worried about, as I had to transport them across London – but they were divvied between two bags, and I made it home with everything in one piece! Overall, it was a very fun day. I was a little disappointed we weren’t able to make everything ourselves (the frosting, ganache, glaze and drizzle topping were all made for us, and though pairing up was fun in its own way it did also seem a shame in an £80 class), but this was perhaps due to the limited space, and to save on time. I enjoyed myself a lot (and am still enjoying all the cake, as are my friends and family! ), and learned some great tips, too. – The best way to crack eggs is with another egg. This means no white is wasted on the side of the bowl, and helps reduce the chance of getting shell in your mixture. – To check if a cake is cooked, don’t poke it with a skewer! An unclean skewer often just means the cake is moist, while a clean one can mean it’s overbaked. Use the ‘pillow or mattress’ test. This involves pressing down on the top of the cake with your finger tip: if it springs back the cake is ready, if it leaves an indent the cake needs a little longer in the oven. – Eggs can be separated easily using a plastic bottle. I’d seen this online but had never tried it, and it blew my mind slightly. – Vanilla pods come from a kind of orchid; they are beans, which are dried to become the leathery black pods we know. The plant is extremely difficult to cultivate and usually require hand-pollination, which is why the pods are so expensive. – After mixing your cake batter, don’t bang the spoon on the bowl! This will knock out air bubbles and can effect the finished sponge. – Sandwich tins can be lined quickly and easily with tin foil, with no greasing required! Cut a sheet bigger than your tin, lie it flat on top, then use your second sandwich tin to sandwich the foil in between. It should create a perfect mould (and will leave the tins clean after baking, too!). – You can make piping bags out of greaseproof paper and origami magic.